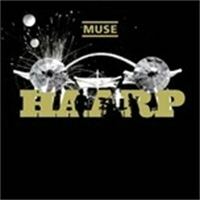 HAARP Tracklisting and Bonus Features Confirmed! We are pleased to confirm the full tracklisting of the forthcoming combined CD and DVD release: AUDIO CD 1. Intro 2. Knights Of Cydonia 3. Hysteria 4. Supermassive Black Hole 5. Map Of The Problematique 6. Butterflies And Hurricanes 7. Invincible 8. Starlight 9. Time Is Running Out 10. New Born 11. Unintended 12. Micro Cuts 13. Stockholm Syndrome 14. Take A Bow DVD 1. Intro 2. Knights Of Cydonia 3. Hysteria 4. Supermassive Black Hole 5. Map Of The Problematique 6. Butterflies And Hurricanes 7. Hoodoo 8. Apocalypse Please 9. Feeling Good 10. Invincible 11. Starlight 12. Improv. 13. Time Is Running Out 14. New Born 15. Soldiers Poem 16. Unintended 17. Blackout 18. Plug In Baby 19. Stockholm Syndrome 20. Take A Bow Also included on the DVD will be behind the scenes footage and a photo gallery. The CD/DVD will come in a special artworked package as well as a dual case edition.